Departments are used to create sub-ledgers for accounts. 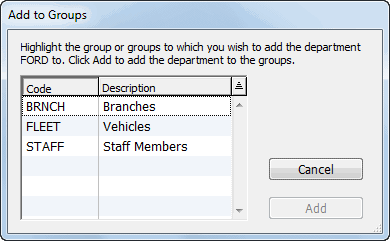 You first define the departments that you want to use, then group them into Department Groups. Finally, by associating a department group with a set of accounts, you end up with sub-ledgers for those accounts. The Departments command in the Show menu displays a list of all the departments set up for your system. If no departments exist, the list will be empty. The list of departments in your system will be displayed. The Department entry window will be displayed. This code is used to identify the department, and is appended to the account code when transactions are entered. It may be up to 5 characters in length. Characters can be either alphanumeric, and letters are automatically capitalised and spaces converted to underscores. The characters “@”, “?” and “-” are not permitted. A classification is an optional way of grouping departments together for reporting purposes. You can add or change classifications at any time. Enter any details in the custom fields. These are for your own use. If you want the department to be used as a heading in a subsummary report, set the Heading Only checkbox. You will not be able to use the department in transactions. If you have already created Departmental Groups, you can add the department to the appropriate group at this point. The Add to Groups window will be displayed. The department will be added to the nominated groups. 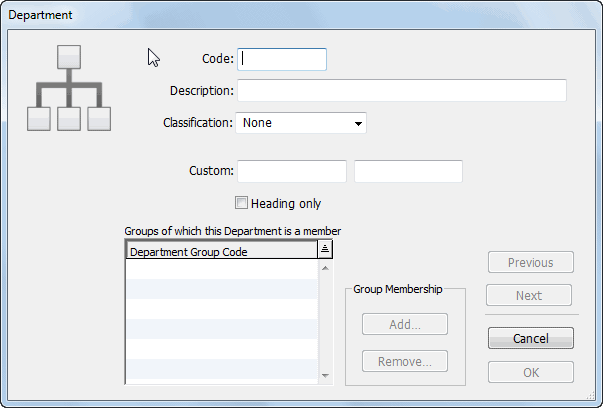 If you have not already created Departmental Groups, departments can be added to Groups when the groups are created or they can be assigned later. Any of the department information can be altered at any time—including the code. If you do alter a departmental code, any transactions that use that department will be updated (this may take some time). To modify a department, double click it in the Department list. Note: You can only change a department, group, or classification code in single user mode—. The department entry window will open. 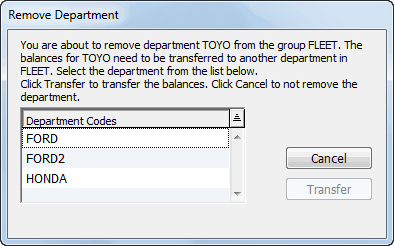 A dialog box asks you to choose which of the other departments in the group will receive the historic balances and any transactions for the department being removed. All accounts associated with the group from which the department has been removed will have that subledger deleted, and any balances for the removed subledger will be transferred to the subledger of the nominated department. All transactions, including posted transactions, that use the account-department are changed to have the nominated department instead of the removed one. Clicking Cancel will close the window without saving the changes.